Burnley benefitted from two own goals in quick succession to seal a vital 2-1 victory over fellow Premier League strugglers Fulham at Turf Moor on Saturday. 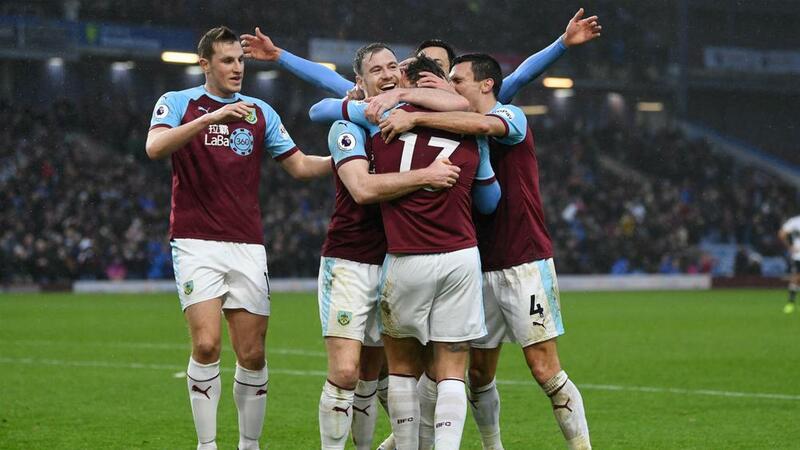 For the second time in as many league outings, the Clarets fought back from behind against a relegation rival to earn all three points, having done so at Huddersfield Town 10 days previously. Andre Schurrle's sensational volley stunned the home crowd inside two minutes but the game was turned on its head midway through the first half as Sean Dyche's men enjoyed two large slices of fortune, in a contest in which they failed to register a single shot on target. Jeff Hendrick was involved in both goals, seeing his blasted effort deflect in off Joe Bryan and three minutes later it was his chipped cross which Denis Odoi nodded beyond Sergio Rico. The second period failed to deliver the same entertainment but Burnley's fourth straight win across all competitions lifts them to 15th, three points clear of the drop zone, while Claudio Ranieri's side are second-bottom and five points from safety. Fulham had failed to score in six of their last nine Premier League away games but they were ahead after 109 seconds here thanks to a moment of supreme quality. Odoi lofted a ball down the right channel, where Schurrle produced a sublime first touch before volleying it over Tom Heaton and in off the crossbar. Burnley mustered an impressive response, however, Chris Wood heading against the post before the unwitting Bryan and Odoi each put through their own net within the space of three minutes. The drama continued apace, Calum Chambers crashing a header against the bar in the 26th minute before James Tarkowski pulled off an excellent goal-line clearance to deny Luciano Vietto early in the second period. The half-time substitute saw a fierce drive parried by Heaton with 15 minutes remaining but despite fierce late pressure, Fulham could not force a precious leveller as the hosts held on grimly. The Cottagers are the only team in the division yet to win on their travels. Ranieri must turn those fortunes around if they are to avoid dropping straight back to the Championship. The Irishman has been in and out of Dyche's XI, and likely would not have started had either Robbie Brady or Johann Gudmundsson been available. But he played a key part in both goals and was a real force driving at Fulham's backline from central positions, particularly in the first half. The two defenders could do little about the own goals, but Ranieri's men never looked stable at the back and their 49 goals conceded is the highest in the league - six more than second-worst Burnley. Burnley will hope to continue their winning run at Watford next Saturday, while Fulham face a London derby with high-flying Tottenham at Craven Cottage a day later.